As you seemed to enjoy last week’s Government Ale recipe, here’s another. This time from Scotland. There’s two boxes ticked: WW I and Scotland. If you thought the Truman GA was watery, take a look at this baby. It’s not even 2% ABV. Why is this beer weaker? Because it’s from a year later, when brewing restrictions were even stricter. Strictly speaking, this isn’t really from WW I, as it was brewed on the 13th November 1918, two days after the armistice. You can the war biting in the grist. 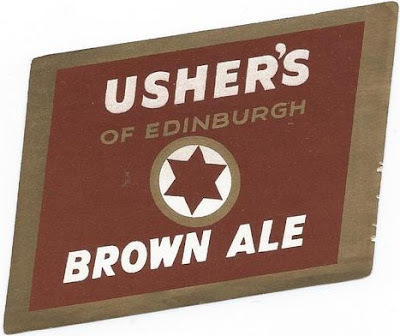 Pre-war and during its early years, Usher’s beers contained flaked maize. But this became unavailable as it had to be imported. Which caused the malt content to increase. There’s still sugar in the recipe, though. Sugar was scarce during the war, but not totally impossible to get hold of. Considering the crazily low OG, it’s reasonably well hopped. Talking of gravity, note how high the FG is. One of the unusual features of Scottish brewing is how similar the FG’s are of beers with very different OG’s. It strikes me that Scottish drinkers expected a certain amount of body, no matter how strong the beers were. It would also have made Scottish beers appear sweeter than English equivalents. The hops are a guess. By this time only English hops were being used in British brewing. Fuggles is the most likely variety, just because that was the one grown the most. You can substitute some Goldings or other old English varieties if it takes your fancy. It must have been fun drinking this stuff down the pub. You’d never, ever get pissed. Probably be safe to drive after a gallon or more. Strictly speaking, it is a WWI beer as the conflict didn't officially end until the Treaty of Versailles was signed the following June, hence the memorial at Victoria station in Manchester dedicated to those who fell in the "Great War 1914-1919". Well it would wash down the scotch I suppose. So how does one get 60% attenuation with a mash temp of 149? Was the wort deliberately under oxygenated? Use a yeast strain with no maltotriose utilisation, early flocculation, mash high, crash early. When did Scottish Pale Ale stop being biiter?